This is my take on the VCA. 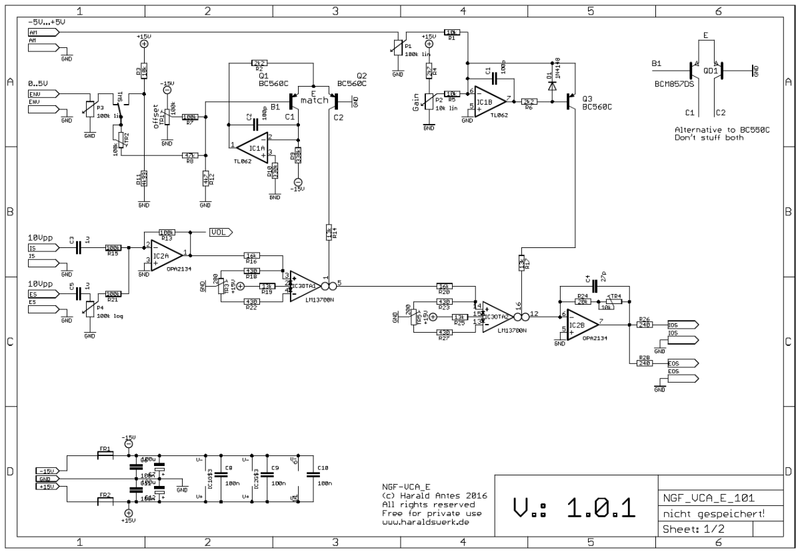 Because this one is for my Next Generation Formant project i started with the original Elektor Formant VCA schematic and added my changes to the design. All parts are updated to today (2017/08) available parts. The connections are the same as in the original to keep the possibility for internal wiring. If you don't need those features just leave them out. 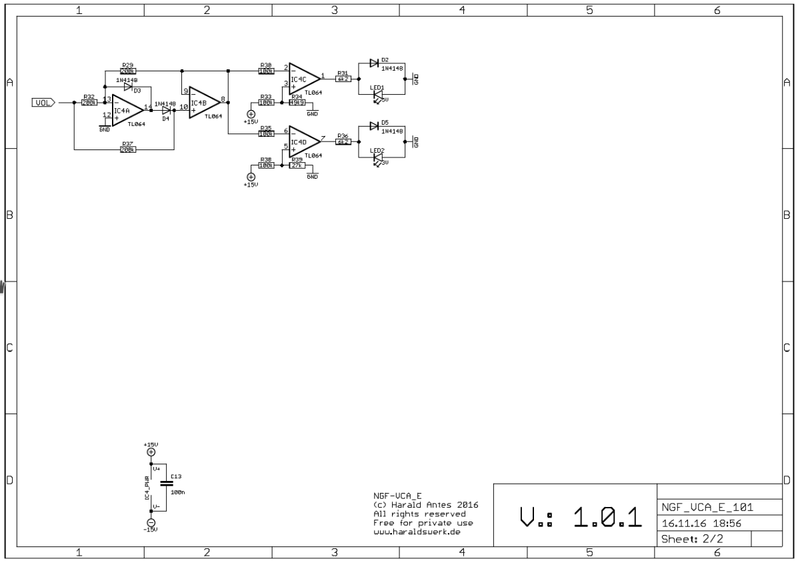 This PCB provides all functions as in the original Elektor Formant VCA. The CA3080 are replaced with LM13700. The signal level is raised to 10Vpp for a better signal to noise ratio. The added volume indicator us useful for finding the appropriate signal level. The volume indicator is optional. You can leave it out with no problems for the other functions. This is a close clone of the Elektor Formant VCA. It consists off two OTA's in serial configuration. The first OTA provides the log response and the second one the linear response. IC2A sums up the external and internal audio signal. The circuitry around IC1A provides the log converter, IC1B the linear current source for the second OTA. Move whipper of TR1 to ground. Look at pin 5 of the first OTA (IC3DTA1) with oscilloscope (signal is at 180deg phase). Adjust TR1 to minimal signal feedthrough (~-3.5V at whipper). Adjust TR2 so that the volume of the signal at pin5 is near the input signal 180deg phase). Set gain potentiometer to max. Adjust TR4 to equal volume for the output signal with the input. Adjust TR5 for minimum DC offset.